Discounted Room Rates for the beginning of Spring …. Driving through Ashland, Oregon this Spring and looking for accommodation that is within walking distance to the Theatre. Look no further. We have an early Spring Accommodation Special on for the opening of the OSF Theatre with discounted Room Rates until the 23rd March, 2019 – from as little at $130.00 per night for two for Bed and Breakfast. Call us now for your booking: Call now! Enjoy seasonal lodging specials and event ticket discounts when you stay at Abigail’s Bed and Breakfast Inn in Ashland. Be sure to check out our package deals for the Oregon Shakespeare Festival below, and visit this page often to see our current getaways and vacation packages. OSF Ticket Specials at Abigail’s Bed and Breakfast Inn! 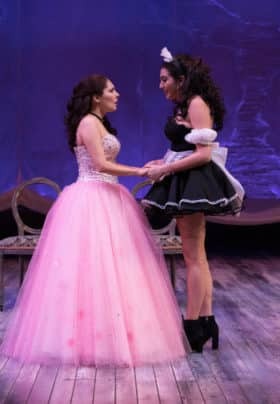 Ticket Specials plus for the Oregon Shakespeare Theatre are available here at Abigail’s Bed and Breakfast Inn this 2019 Season. This offer is combined with your accommodation, a two-course complimentary breakfast, and wine tasting at selected vineyards based here in Ashland, Oregon and Gold Hill, Oregon – Eliana Wines and Del Rio – thus making for a great vacation package for that special occasion or stress-free break! This offer is also available for our Abigail’s Vacation Cottage bookings! Welcome to the Oregon Shakespeare Festival where, “All the world’s a stage…” and Ashland, Oregon is the place to see it! Come and experience the award-winning Oregon Shakespeare Festival in a convenient no-hassle OSF Discounted Ticket Special package. Stay in our beautifully maintained 1904 Craftsman B&B. We have five guest rooms, all en-suite with king, queen or twin beds. Each room has its own individually controlled air conditioning / heating units, Wi-Fi, tea/coffee making facilities and cable TV. Every afternoon you are encouraged to partake of tea and freshly baked goods. Complimentary beverages and snacks are available 24/7 downstairs in the dining room. Take a leisurely 15-minute walk into downtown Ashland, and enjoy boutique shopping, gourmet dining; take in a wonderful play of your choice; OSF 2019 Season Plays, sleep well and awaken to a delicious homemade breakfast guaranteed to start your day off right. Complimentary wine tasting for 2 at selected Southern Oregon Vineyards. This package is available Sunday through to Thursday. Fall Season from September 4 through October 28, 2019. For further information, contact us at Abigail’s Bed and Breakfast Inn. INN-Dulgences at Abigail’s Bed and Breakfast Inn! SAY IT WITH “FLOWERS!” Seasonal Flowers from @ $25.00 to be placed in your room prior to arrival. ABIGAIL’S SOUVENIR MUGS take home a momento of your vacation this year @ $20.00 per mug or buy two for $35.00. Oregon Shakespeare Theatre here in Ashland, Oregon "Destiny of Desire". Oregon Shakespeare Theatre here in Ashland, Oregon "Othello". 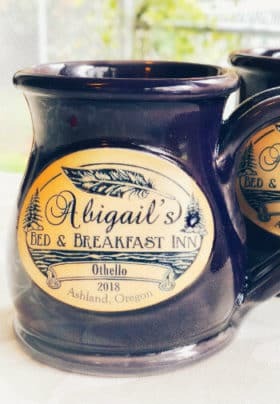 Abigail's Bed and Breakfast Inn personalized mugs! Order flowers for that special occasion. 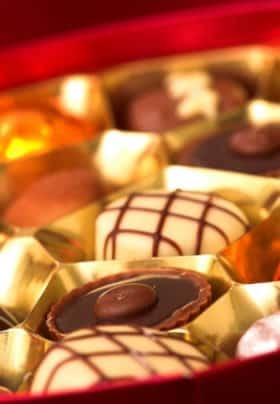 Local handmade Chocolates for romance or that birthday celebration.